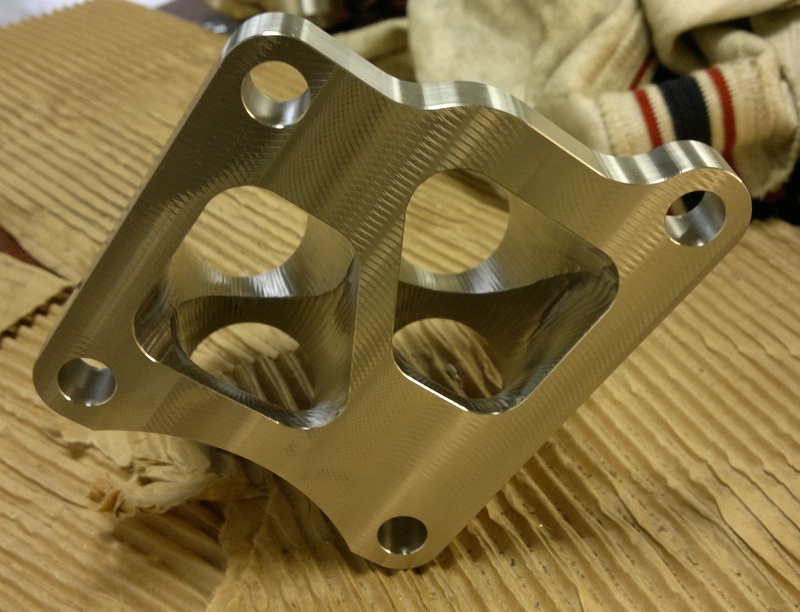 We are now offering the world's first fully CNC machined billet merge collectors for sale. 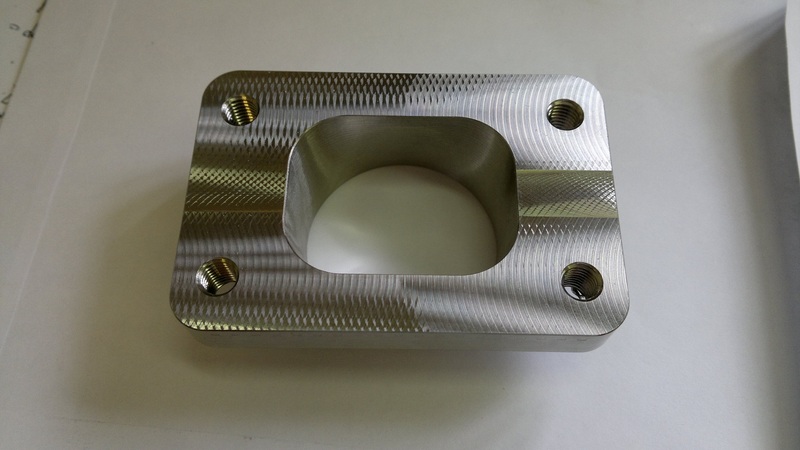 Machined from a single piece of mild steel or stainless steel they have no weld seams and are extremely strong. 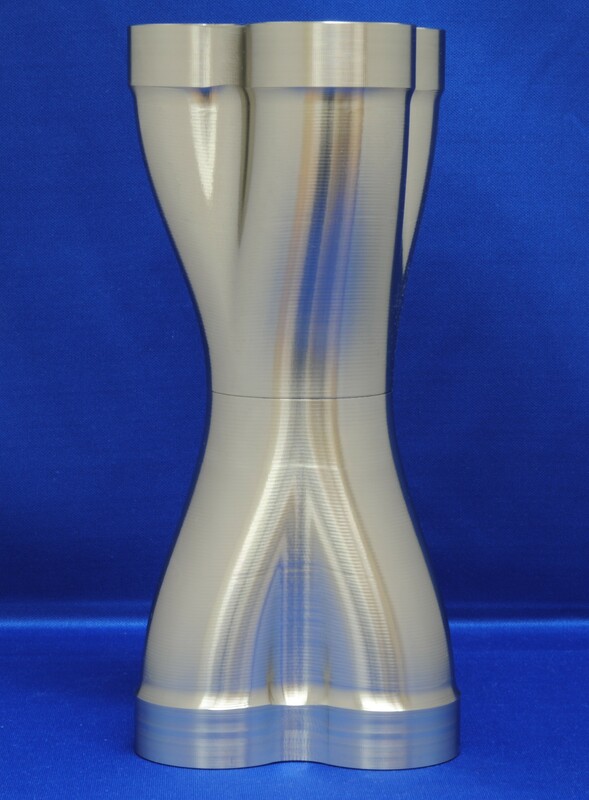 You will not find similar collectors for sale anywhere else. 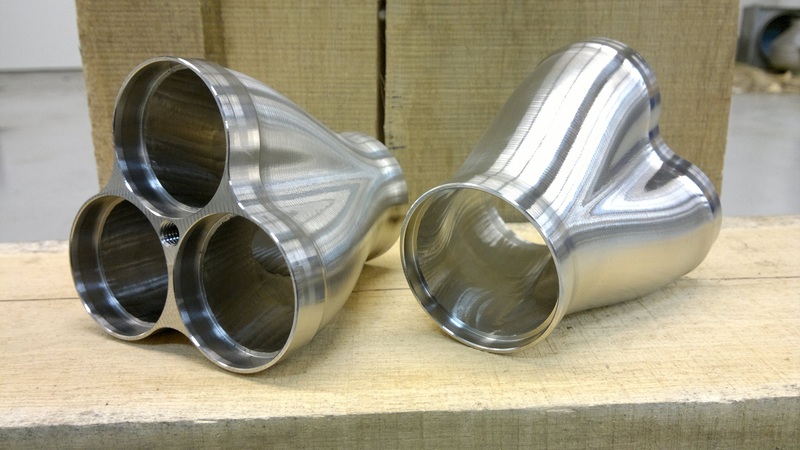 Compared to welded collectors the inlet and outlets are also guaranteed to be perfectly round for a better fit. 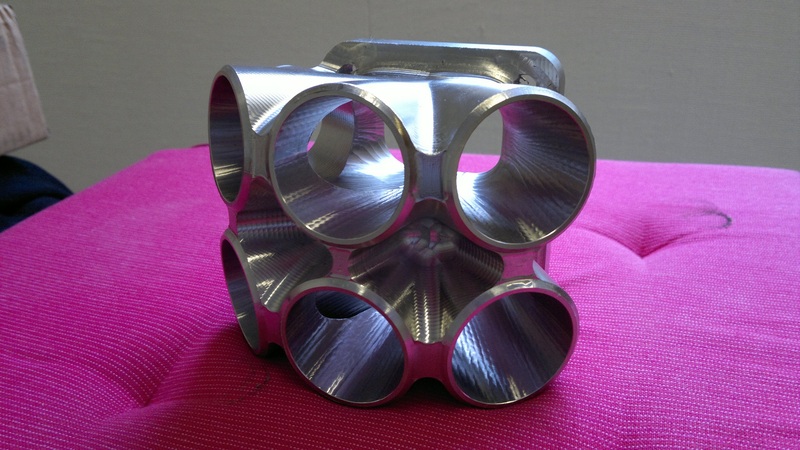 Welded merge collectors also typically have a relatively tight radius at the outlet, or in the case of turbo collectors no radius at all. 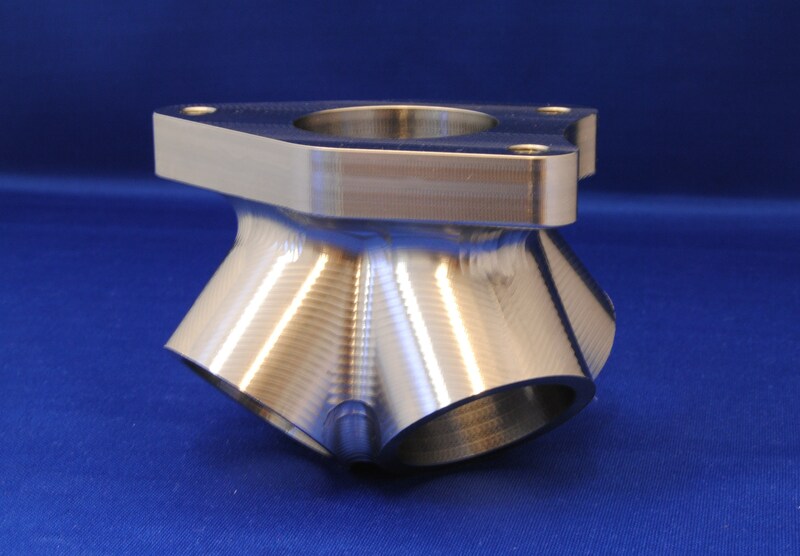 Our CNC machined collectors make a continuous and smooth transition from the inlet all the way to the outlet. For businesses making turbo manifolds our collectors can result in huge time savings. 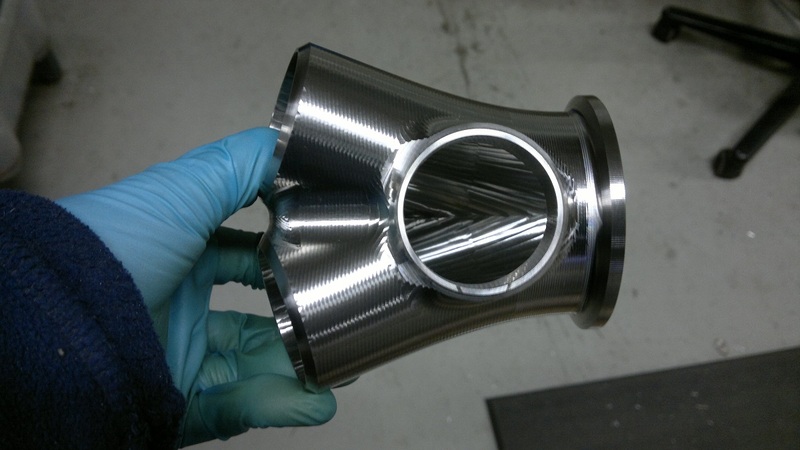 Why spend hours and hours cutting and welding and grinding a collector when you can simply purchase one of our billet collectors with superior properties, giving you an advantage over your competition. Or if you are an amateur builder you likely won't have the right equipment to properly cut the pipes, making it even more time-consuming to make your own collector. 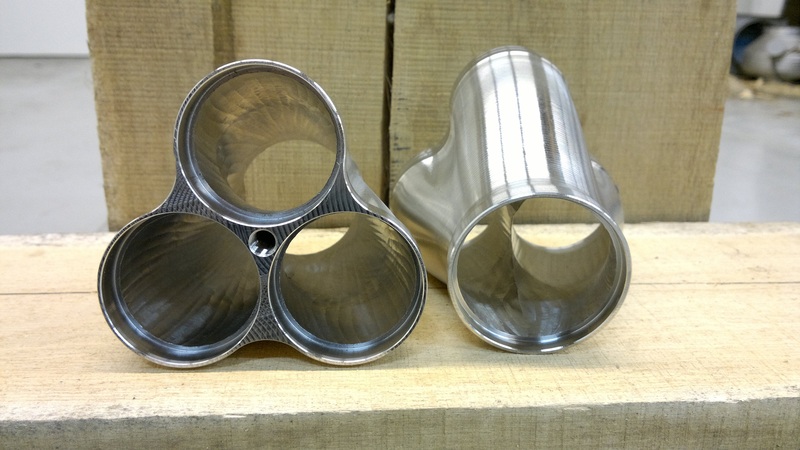 Below are a couple of cutouts of our collector designs, showing the smooth transitions from the pipe entry all the way to the end/flange, there are no unwanted straight parts. The internal surfaces on all of our collectors are machined in the direction of the flow for maximum performance. 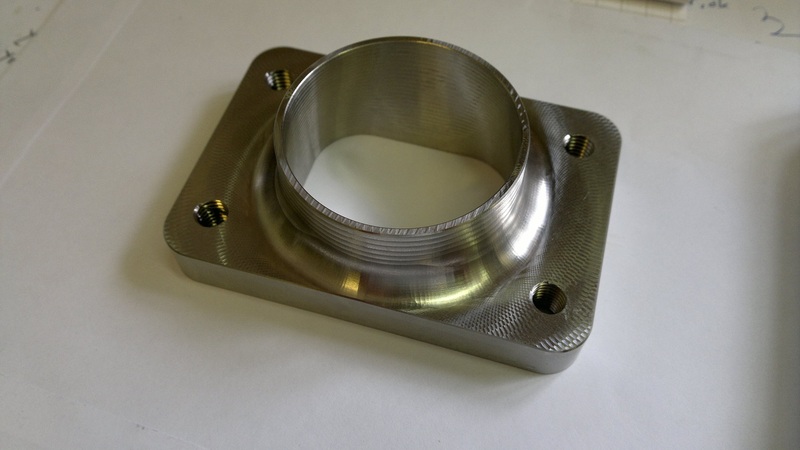 Upon request we can also machine the internal/outer surfaces with a tighter step for an even better surface finish. 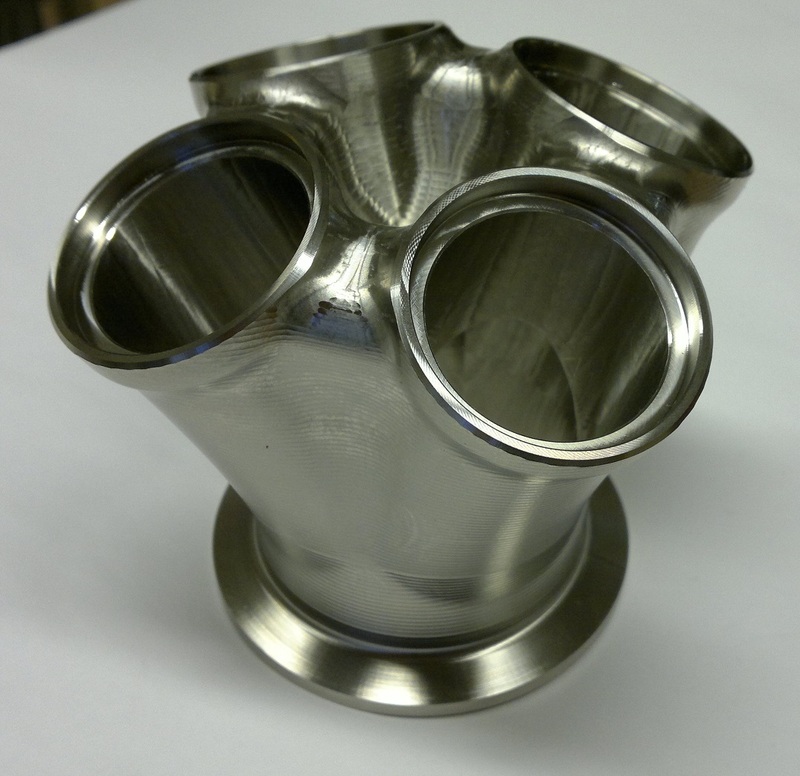 Because of the way our collectors are manufactured we aren't limited by standard exhaust sizes, instead we can manufacture them with virtually any inlet/outlet sizes. The only limitations are the total length of the collector and to some extent the size of the outlet. 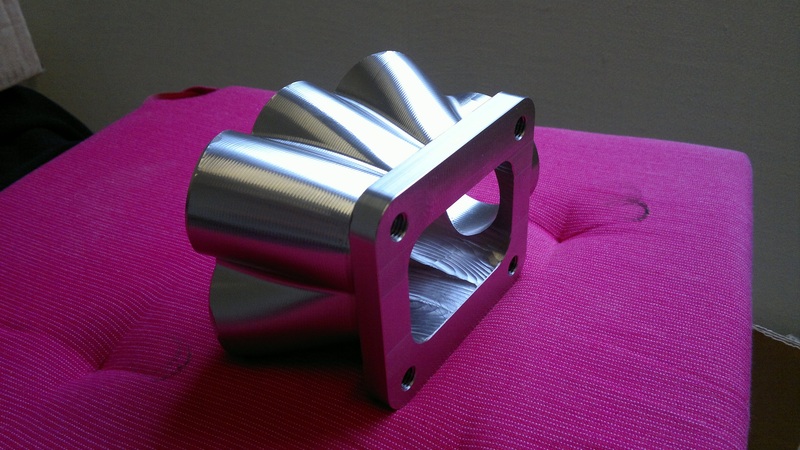 The large fillets used in our designs greatly reduce the maximum stress in the collector. This stress can be caused by the weight of the turbo, acceleration, thermal expansion of the manifold etc etc. 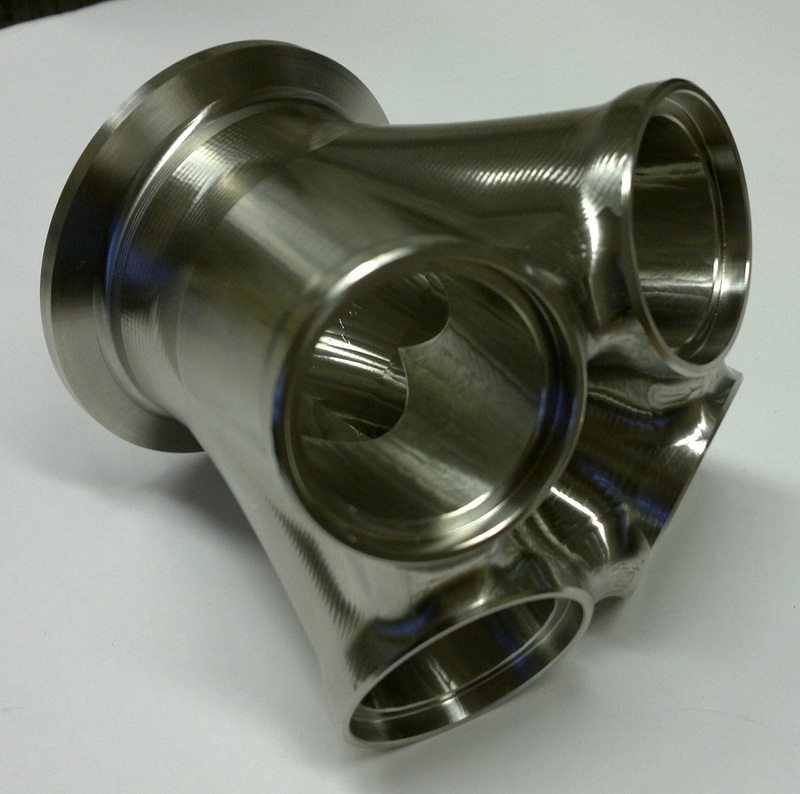 This further increases the reliability of our billet collectors compared to welded versions. 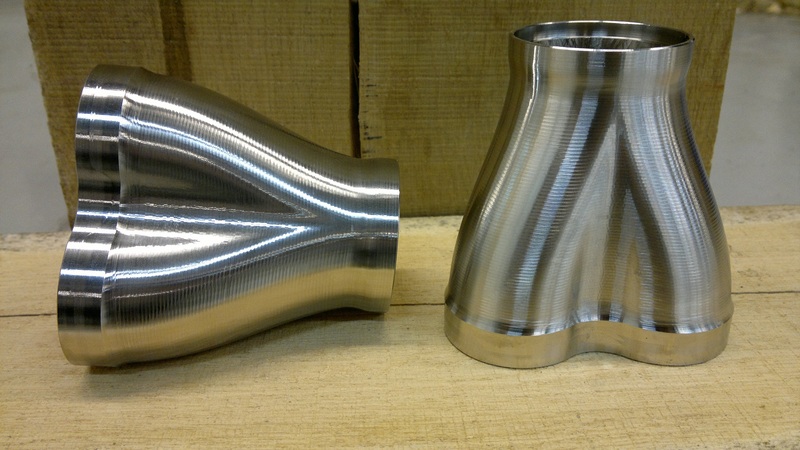 Welded collectors have small fillets which causes much higher stress, often exactly where the weld is. 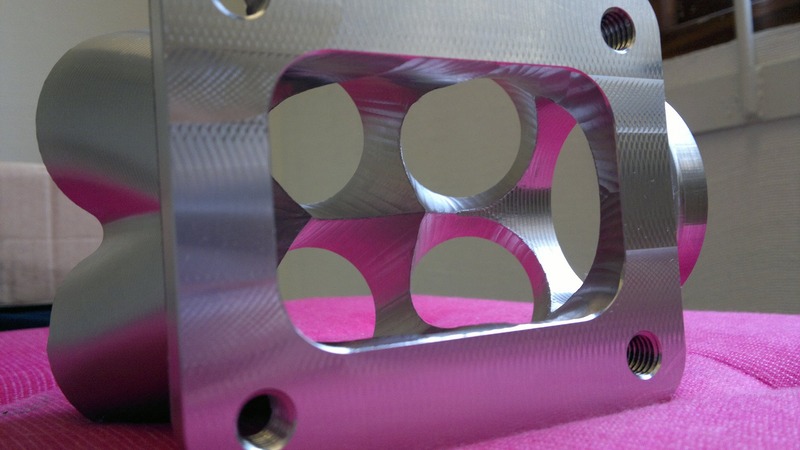 In addition it can be very difficult/impossible to get the welds to completely penetrate the material, depending on the geometry of the collector. Any imperfections will further increase the stress making it more likely to crack. 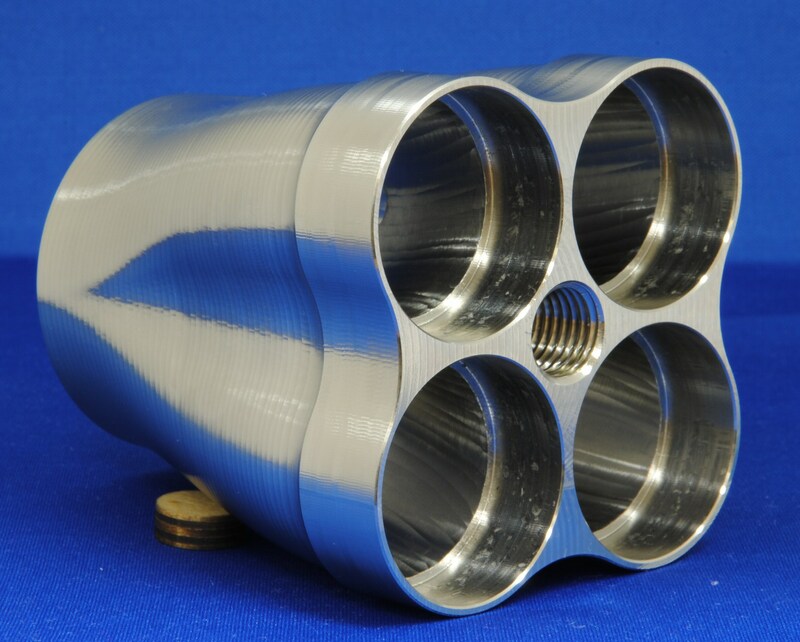 Our billet collectors are guaranteed to not have any air bubbles or other imperfections in the material. 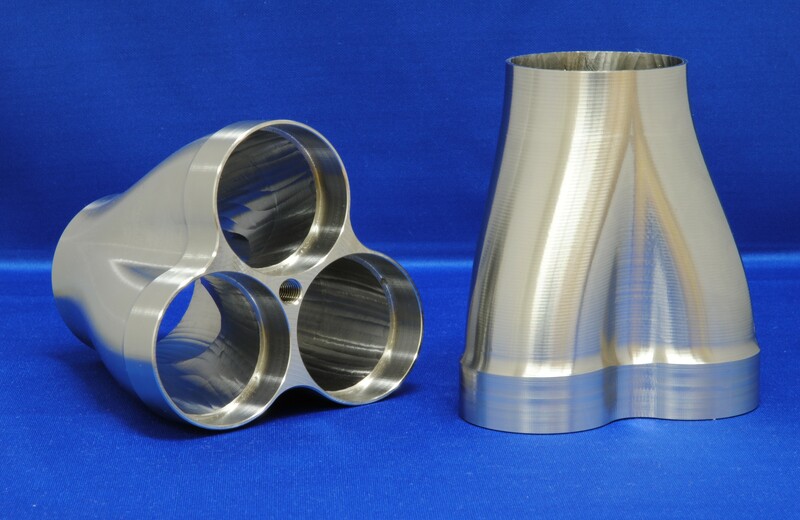 As can be seen from the above pictures(welded to the left, billet to the right), the maximum stress is more than halved in our billet collector under identical load conditions, giving superior durability. Our raceshop is now up and running. 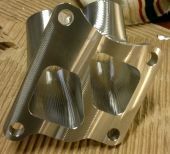 We are offering both collectors as well as some other components such as cylinder heads and exhaust adapters. Below you can see pictures of some of the collectors we have made so far. 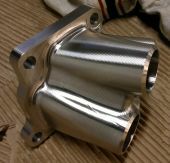 A 4-evo turbo collector for the Mitsubishi Lancer Evo, from stainless steel of course. A pair of 4-1 v-band collectors with 38mm inlets and a gtx35 size Tial v-band. A 4-1 Garrett v-band collector with 1.5" schedule 40 inlets, the smooth transition continues all the way to the end of the collector, something that would be impossible/extremely tedious to do by hand. A 6-1 T4 turbo collector with integrated wastegate outlet. 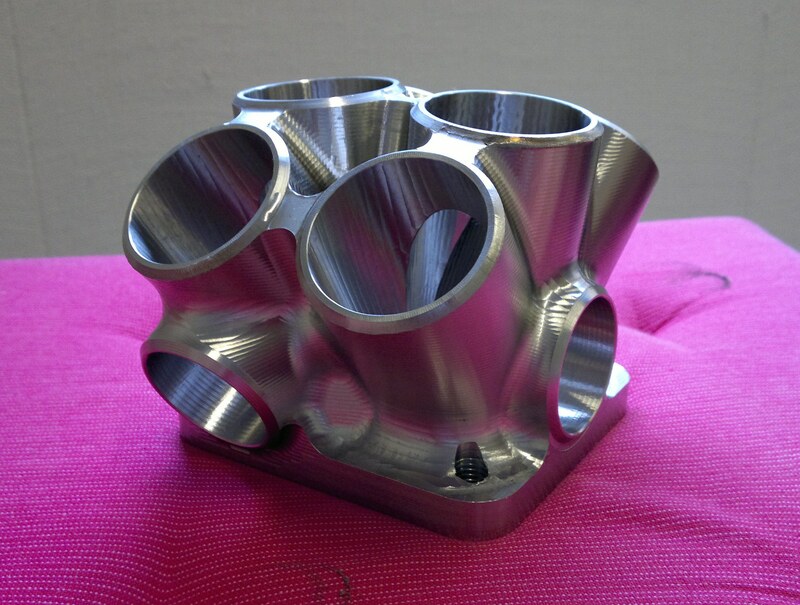 Made from 304 stainless steel. A 6-2 twin-scroll T4 turbo collector with dual integrated wastegate outlets. 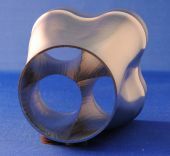 Made from 304 stainless steel. 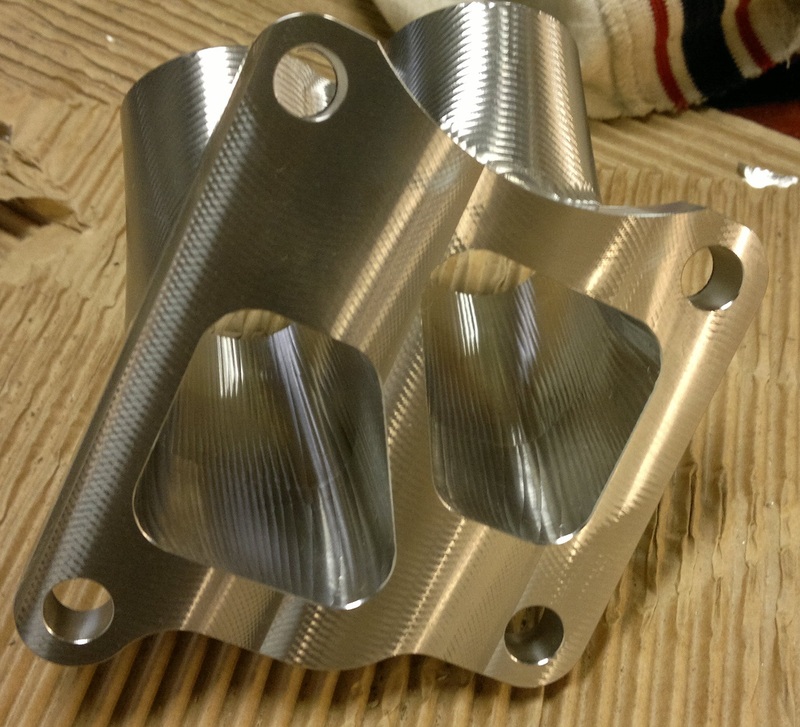 A couple of 3-1 stainless steel merge collectors we made for a customer. 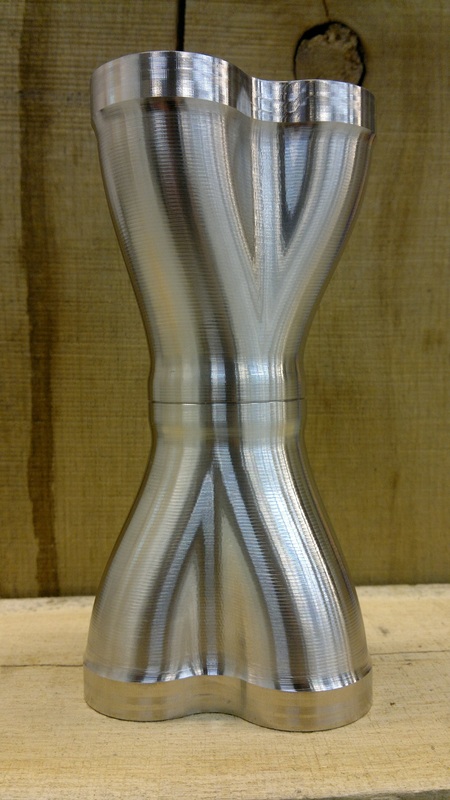 A couple of other 3-1 stainless collectors with an integrated short slipover at the outlet for easy welding. 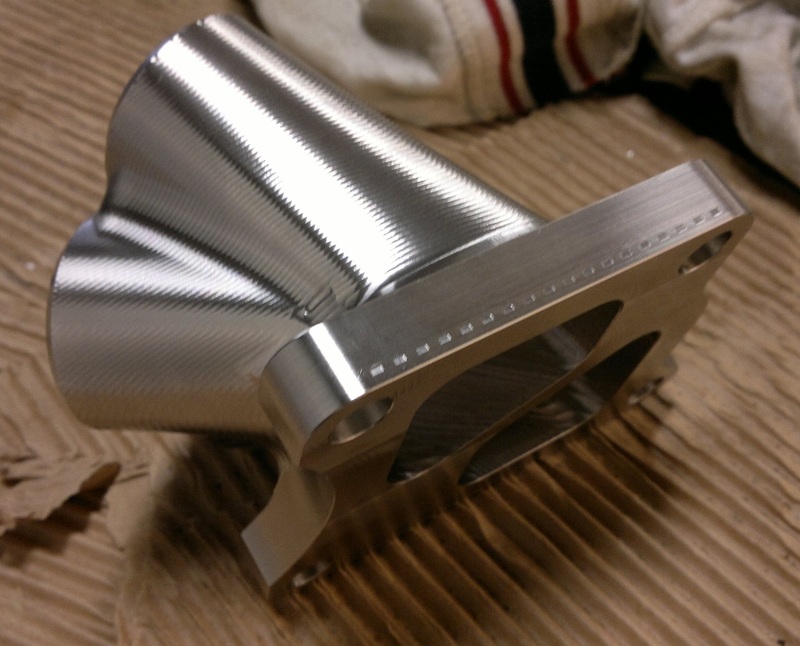 A relatively simple 4-1 turbo collector made from stainless steel. 2 4-1 mild steel collectors with integrated v-band flange at the outlet, no welds whatsoever. 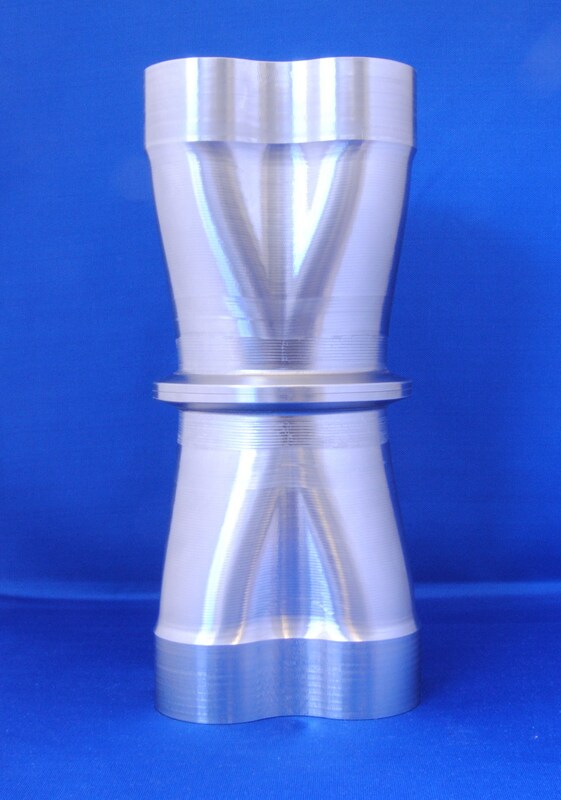 A 2" to T25 adapter made from 304 stainless, featuring a smooth transition.